A very strange weather pattern settled over this region in late July, resulting in unusually heavy monsoon thunderstorms every night for several days here in Tucson. At my house, I got 5.75 inches (14.6 cm) of rain in just 4 evenings. The average annual rainfall in Tucson is only 12 inches (30.5 cm), so this is about half of our yearly total in only a matter of days. Our desert soil just couldn't handle it, and each morning revealed progressively worse flooding in our local washes, more washed out and submerged roadways, and more flooded houses. 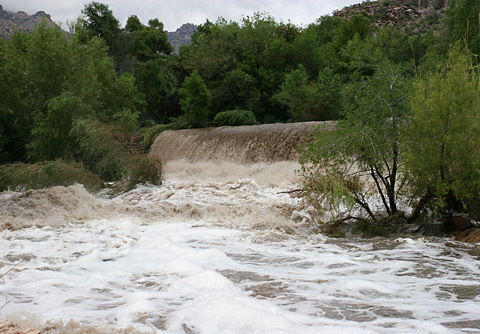 This is what the dam at Sabino Canyon looked like on July 29, 2006. 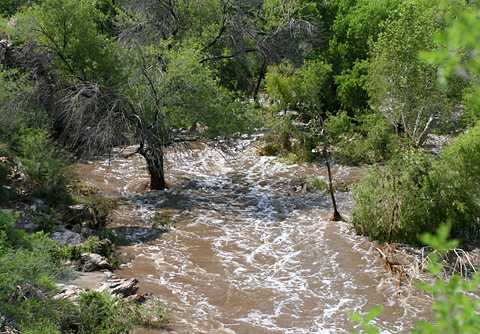 The creek below the Sabino Canyon dam was a raging torrent. And Sabino Canyon was flooded bank to bank. 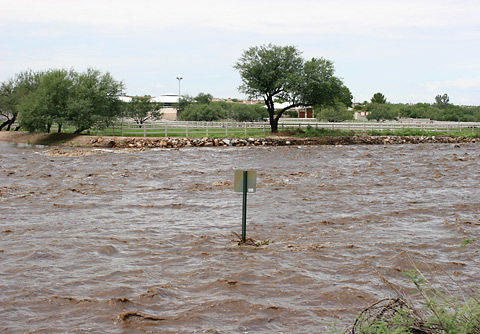 The flooding only got worse in the following days, with the worst flooding on July 31, 2006. Parts of the road into Sabino Canyon have now been washed away, and I'm not sure when it will reopen. 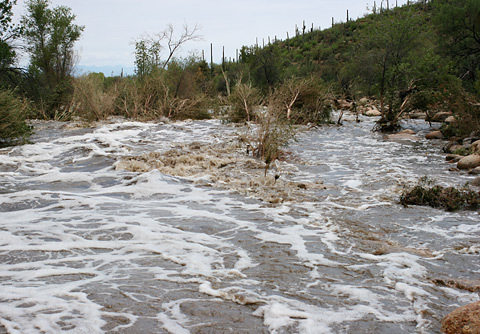 Here are some more photos of a flooded Sabino Canyon. 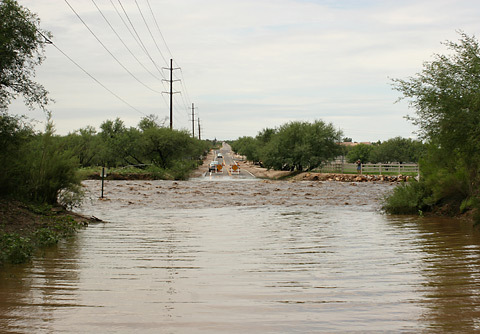 This is what Tanque Verde Loop Road, a road that I frequently use, looked like where it crosses the Tanque Verde Wash on the morning of July 31, 2006. This road dips down as it crosses the normally dry, wide, sandy Tanque Verde Wash, so the water is even deeper than it appears. With our severe drought over this past winter, it has been quite a while since even so much as a trickle of water has flowed down this pitifully dry wash, so seeing a flood in it is quite stunning.